Thomas R. Snoddy, Sr., 82, better known as "PeeWee", of Charlottesville, Virginia, went to be with Jesus Christ, his beloved Lord and Savior on Monday, March 26, 2007, after a brief hospitalization at Martha Jefferson Hospital. 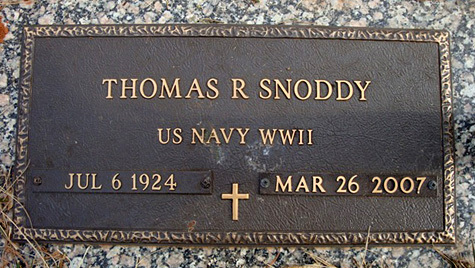 Born July 6, 1924, in Buckingham County, Virginia, he was the son of the late Eric Wood Snoddy and Mabel Brown (Steger) Snoddy. He was also predeceased by his brother, Theodore Snoddy; and his half brother, Ernest Rea Snoddy. 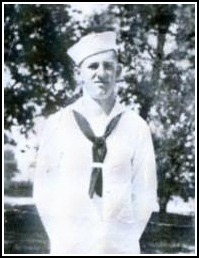 In 1943, Pee-Wee was drafted, and served in the United States Navy during World War II on the USS Orion. Upon returning to the states, he married the love of his life and the mother of his three children, Thelma May Baber. Pee-Wee worked in the appliance department of H.M. Gleason & Co. for 18 years, where he gained much experience and many lifelong friends. In August of 1967, after leaving H.M. Gleason & Co., Pee-Wee started R.M. Davis Appliances in the showroom of R.M. Davis Motors located on 29 North, an innovation for the 1960's. After Mr. Davis' retirement, Pee-Wee and his son, Randy, purchased what is now Davis Appliance Co. Inc. located on High Street. Although he was at the store the Thursday preceding his death, he was especially proud to still be part of and be able to continue this business with his son, Randy SNODDY. Randolph was a member of Belmont Baptist Church and spent his life loving God, loving others and serving both. His life served as a testimony for all who came to know him. He made a difference in many peoples lives and was very respected. He was a loving and devoted father, grandfather, husband, and a friend to many. Pee-Wee is survived by his most loving and devoted wife of 60 years, Thelma May (Baber) Snoddy of Charlottesville (married May 25, 1946, Buckingham, Virginia); two sons, Randy Snoddy of Earlysville, and Ronnie Snoddy and his wife, Sandy, of Ruckersville; his daughter, Terry Lynn of Earlysville; his two precious grandchildren, Ashley Nicole Henderson and James Randolph Snoddy; and his two half sisters, Norma Miller and Cathy Sides. Pee-Wee is survived by many people whom he loved, cared for and respected. The family would like to extend a special thanks to Dr. Hammond for his loving care to Pee-Wee over the last several years. The family will receive friends from 7 until 8:30 p.m. Thursday, March 29, 2007, at the Belmont Baptist Church. Funeral services will be conducted 11 a.m. Friday, March 30, 2007, at the Belmont Baptist Church with Pastor Greg Anderson officiating. Interment will follow at Monticello Memory Gardens, Albemarle County, Virginia.